Francine's Friends: "Life with Francine's Friends" is an Emmy Nominee! "Life with Francine's Friends" is an Emmy Nominee! Francine's Friends recently learned that "Life with Friends" - the short film created last year and presented at the 2011 October luncheon is a 2011-2012 Emmy¨ Nominee. The news was announced by the Chicago/Midwest Chapter National Academy of Television Arts & Sciences. 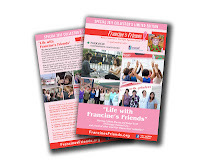 "Life with Francine's Friends" was one of four out of 14 that submitted in the category: Outstanding Achievement for Informational/Instructional Programming - Program/Special/Series/Feature/Segment (Award to Producer/Host/Reporter). Robyn Scott and Colleen Murray, of Chicago's Second City star in "Life with Francine's Friends" and are also real-life best friends. 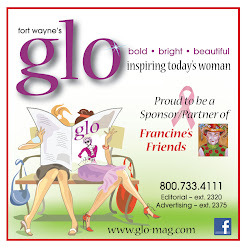 In addition to Scott and Murray, "Life with Francine's Friends" features Francine’s Friends founders, partners, board members, funders, sponsors, table captains, community supporters, breast cancer survivors and a host of other “friends” and was filmed locally at Toscani's Pizzeria, Fort Wayne Urban League, Scotts Foods and TrendSetters Hair Design. "What's fun about the story is that it has a lot of moving parts that integrate so well. There are the two main characters and their journey, the people they meet and learn from and the individuals on the couch who tell their stories and partially narrate the journey of the main characters," explained John Cuneo. "It was a big project that required a lot of support and collaboration with the people of Francine's Friends, and look at what happened as a result." PUNCH films provides production services for a wide range of interests by offering the proper allocation of resources and abilities along with the collaboration and experience needed to support broadcast and digital projects. PUNCH won it's first Emmy in 2011. "Life with Francine's Friends" is PUNCH's third Emmy nomination. To see more of their work, go to: www.punchfilms.com.